1. A temperature of 102 degrees with humidity. No more 80 degree weather with cool ocean breezes. When I got out of the car at a New Jersey rest stop my sunglasses fogged up and I felt like I needed an inhaler (I don’t even have asthma). Serene views and no humidity! 2. The social repercussions of drinking alcoholic beverages (even if they are local) in the middle of the day. If I had a cooler filled with blueberry wine at my work desk, everyone would plan a coffee break intervention; but when on vacation, no one blinks an eye if you’re enjoying a glass with lunch. Or if you mix red wine with Fresca as an afternoon treat (don’t turn up your nose until you try it). 3. Making my own breakfast. You mean I can’t get up at the crack of 9 am and take a leisurely walk down the blue hydrangea-laden sidewalk to my favorite breakfast spot? Instead I have to slurp down coffee while cooking my own eggs and simultaneously packing lunch/drying my hair/driving to work. Bummer. This photo has not been retouched at all. The colors of vacation hydrangea are unbelievably vivid. 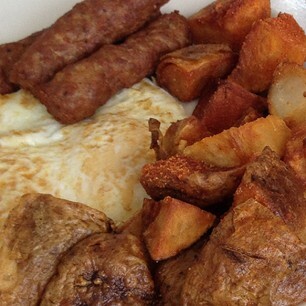 Two eggs over easy with sausage and home fries. Breakfast of vacation champions. 4. Wearing clothes. I had to put on REAL clothes today. Not just a bathing suit and a comfy cover-up. Or yoga pants and a tank top. Clothes that involved buttons and zippers and (gasp!) shoes. 5. Lack of fresh, local seafood on the cheap. 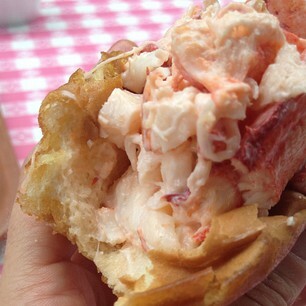 I ate the best lobster roll I’ve ever had for only $13. Yes, $13!! Panera sells one that I’m sure is sub-par for $18. Who wants to eat a lobster roll at Panera? 6. No more farmer’s market hopping in cute, new towns. 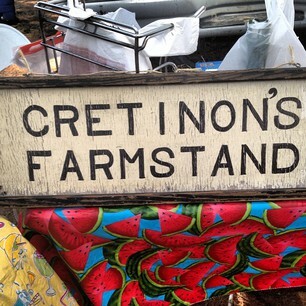 I experienced the best in farm stands and farmer’s markets while away. They were all over the place, offering just-picked produce and artisan food items. All in all these “downsides” are really just affirmation that I need to continue my local experiment in Delaware with gusto. While I’ve already discovered many places to eat and buy locally delicious foods, I’m excited to see what else is out there. So here’s to local summer discoveries and day trips that feel like vacation! 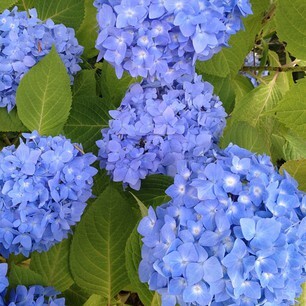 Hydrangeas only look good when you’re on vacation, BTW. Especially so in Italy. Do not try to grow them yourself. I have a skinny one in my yard and it makes me feel sad and nostalgic. 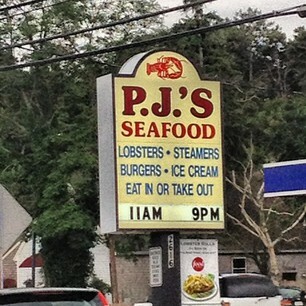 I can’t stop talking about those lobster rolls. I feel the same way about hydrangeas! They are terribly persnickety. At my old house I had a little luck growing them in partial shade with morning sun and a steady diet of coffee grounds. Is it weird that I thought of you when I said, “don’t turn up your nose until you try it” about the Fresca and red wine? I knew you would say something about that. 🙂 It only works with really cheap red wine because who would mix a good bottle with Fresca? I like to keep it classy sometimes. Oh dear, am I in danger of developing a snob reputation amongst my blogger friends!? I like a girl who can swing between the worlds of lobster and cheap wine. Well you did just use the word “amongst” so. . .
I’m glad you made it through the Jersey humidity alive! It looks like this heatwave is finally over. FOR NOW. And clothes with buttons – I’m with you. Overrated. 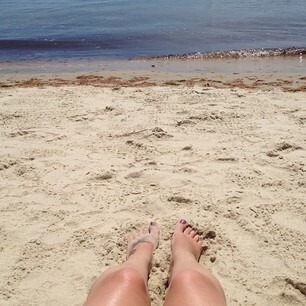 Is that first beach pic really in MA? It’s amazing! It looks like a tropical location! Cheese and rice! I’m gonna have to start saying Cheese and Rice!! Yes, that’s Skaket Beach in Orleans, MA. So beautiful. 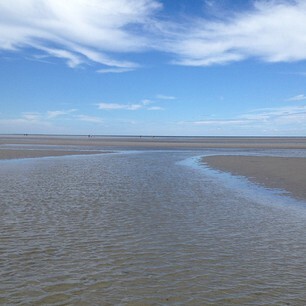 The tide goes out for miles. We also went to Nauset Beach which was closed down a few days later due to a Great White Shark swimming 30 yards from shore! Yikes! If you try the Panera lobster roll let me know how it is. They had them a few weeks ago over here in Dellywhere. An $18 Panera lobster roll sounds like a guilty pleasure to me! It must be a seasonal thing. Damnit, Panera! I agree with all these! Except I’ve never had a lobster roll…I now want to go to Panera and get one, but perhaps that ins’t the best place to try it for the first time. Cheers to you!